LeBron James' status for Wednesday is up in the air after he twisted his ankle Monday against the Jazz. MIAMI — LeBron James said Tuesday a left ankle injury would have prevented him from facing the Indiana Pacers if the game were that night instead of Wednesday. Then again, James said he definitely would play if the Eastern Conference battle were a playoff game. Truth was, James’ status will be decided close to tip-off for Wednesday night’s game against the Pacers at American Airlines Arena. Or was that the truth? James twisted his ankle late in the third quarter of Monday night’s 117-94 home win against the Utah Jazz. He returned in the fourth quarter, but following the game said he was more concerned how the ankle felt after waking up the next morning. “It’s a little sore. 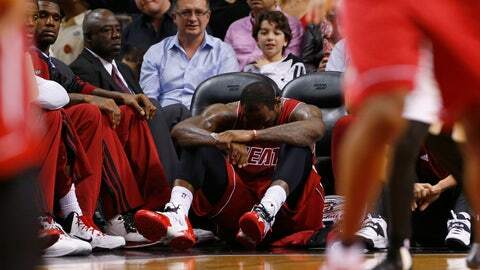 (I’ll) get some treatment and play it by ear,” said James, who practiced lightly during the team’s Tuesday workout. The Heat (18-6) certainly hope to have James against the Pacers (20-4) as both teams fight for home-court advantage throughout the conference playoffs. The Miami star had 30 points, 9 rebounds and 9 assists against the Jazz — the second straight game he fell one assist and one rebound shy of a triple-double. “I’m going to sit if I’m not feeling comfortable (Wednesday night), no matter who we’re playing,” he said. “Obviously, if it was a playoff game, I would play. The Heat will be trying to avenge a 90-84 loss at Indiana on Dec. 10, when Miami played a strong first quarter before being worn down by the Pacers. James defended Paul George, who scored 17 points in that first meeting. “He wasn’t our biggest problem. We still have to worry about that two-headed monster they got, Roy Hibbert and David West,” James said. Hibbert had 24 points and five rebounds, and West added 17 points and nine rebounds to help the Pacers exploit Miami’s weakness off the boards and in the paint. Despite much fan and media talk hyping the latest Heat-Pacers game, Miami’s players were low-keying the meeting between last season’s Eastern Conference finalists.